When I began this series I mentioned that the target material plays an important part in deciding which pressure and flow rate is best for a particular task. Sometimes time also has a role, and not always in the way of "faster is better". I mention this because we made a mistake once. (Well we only made this mistake once, didn’t mean we haven’t made other mistakes). 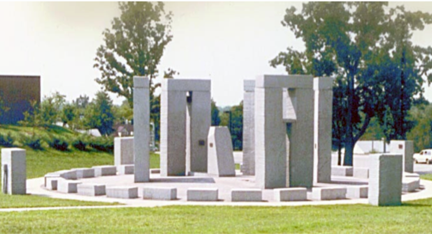 Almost thirty years ago we carved the granite blocks that make up the Missouri S&T Stonehenge, a half-scale Americanized version of the British megalith. The campus Americanized it when Dr. Joe Senne, the Civil Engineering professor who designed it, incorporated an analemma, based on the calendar developed by the Anesazi in New Mexico. This replaced the 19-stone inner bluestone ring of the original. The MS&T Stonehenge was chosen as one of the ten Outstanding Engineering Achievements of 1984, by the National Society of Professional Engineers, in part because the 160-ton 53-stone structure was carved from Georgia granite by high-pressure waterjets, without the use of abrasive. It has, over the years, generated a lot of interest (even getting me onto the Tonight Show with Jay Leno) but that has also included the odd local “artist” who has adorned it with graffiti. My initial response, when this first happened, was to go over to the monument immediately with a high-pressure pump and start to wash the paint off. And that was the mistake, for two reasons. Firstly the paint was not totally dry, and secondly we had not protected the stone with an invisible protective coating to seal it. Thus when we tried to wash the paint away, while we removed all the surface paint, and to a casual observer it remains clean, we had driven a small fraction of the still liquid part of the paint into the pores and grain boundaries of the granite. Thus, if you know where to look, there is still a slight discoloration where that first writing was removed. Shortly after that, on the advice of the Georgia Granite Association, the campus found a coating that was applied to the rock, sealing the pores and grain boundaries, and future cleaning was made a lot easier and more effective. However it did not completely solve the problem, since future cleaning had to be done in such a way as to remove the spray paint, while leaving the protective coating. And that reminds me of a funny story. Graffiti is a significant urban problem, and it costs cities like Albuquerque in New Mexico about $1.3 million a year in clean-up costs. Much of incentive for almost immediate removal is because it is a way for street gangs to mark their territory, and this motivates police to urge an aggressive treatment policy. But what happens if it is art? There are street artists who, in various ways, not related to gang activity, have chosen to decorate, for free, generally abandoned buildings. 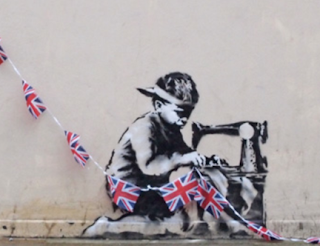 Perhaps the most famous of these is Banksy, recently making the news when a piece he painted on a London wall appeared in a Miami auction house, where it was anticipated to be worth around $600,000 before being withdrawn from the auction. At one time Albuquerque had a similar idea, of hiring those who were spraying the town walls to instead create works of art on some of the otherwise blank concrete surfaces such as bridge abutments around town. Unfortunately this led to an awkward situation. One of the local artists had painted some of his art on a fly-over. 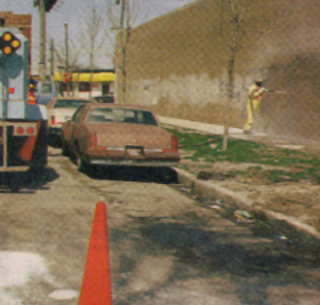 Shortly thereafter the city sent a crew out to cover up the remaining graffiti with a coat of whitewash. Unfortunately the crew were not artistically trained, and so covered up the new work of art. For some years I had a photograph of a waterjetting crew working on that site. At first glance they were removing graffiti, but in reality they were taking the white coating from the painting to re-expose it to public view. And this is one of the advantages that waterjets possess in that they can, with care and training of the personnel, be used to preferentially remove individual layers of material, whether of dirt or paint, without doing any damage to the material underneath, the substrate of the surface. This is important, for example, in removing paint from buildings where the underlying substrate may be a relatively weak wood surface, where any high jet pressure would be enough to eat away the softer parts of the wood turning a smooth wooden sill into an etched and rough surface far from the desired result. Thus, in these circumstances, there is a need for very fine pressure control if the desired result is to be obtained. And sometimes the material that is to be removed is not that easy to remove with water power alone, at an acceptable rate, because the pressure has to be lowered to the point that it only removes the paint at a slow, and uneconomic rate. At that point it is possible to add a relatively soft abrasive, something like a baking soda, that will not only be effective in removing the material, but is soft enough that it will do relatively little damage to the surface. At the same time many of these softer abrasives are also soluble, which means that the costs of clean-up can also be reduced. In some cases the water pressure need be little more than tap pressure. Figure 3. Figure 3. low pressure waterjet graffiti removal using soluble abrasive.